eGPU Enclosure that Adapts to your Gaming Needs Add extra graphical power to your laptop with the Razer Core X eGPU Enclosure. With a simple plug in and play system involving Thunderbolt 3 you can get fast performance as quickly as plugging in a cable. Gain incredibly fast transfer speeds of 40Gbps giving your light laptop system the revved up power of a full desktop GPU. Designed in the same Razer style you see from other products across the board the Razer Core X sits on your desk discreetly with other Razer products giving your setup one whole unified look. Tune Up your setup with extra GPU BoostThe Razer Core X features support for the latest PCIe desktop graphics cards including NVIDIA GeForce and AMD XConnect enabled Radeon cards. Highly mobile developers can now harness the power of compatible NVIDIA Quadro cards for professional graphics performance. 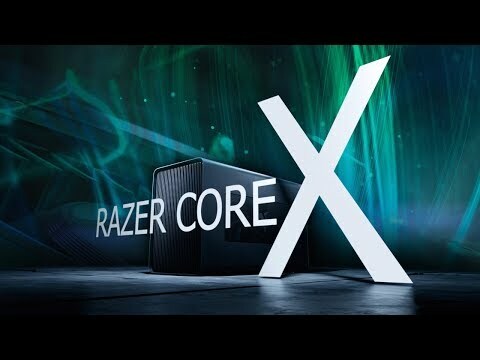 Plug and Play System with your LaptopWith the Razer Core X there is no need to reboot your laptop every time you connect any external graphics. For quick connection to your game session, The Razer Core X is plug and play when connected with compatible laptops. Now compatible with NVIDIA GeForce RTX graphics - Windows 10 systems only The Thunderbolt 3 (USB-C) connection between a laptop and Razer Core X yields incredibly fast speeds at up to 40Gbps, while offering a standard connection to various systems. Give your thin and light laptop the power of a full gaming rig. Whether you’re hunting down enemies in an apocalypse or designing your own 3D world, the Razer Core X delivers desktop-class graphics to your laptop instantly. Compatible with Thunderbolt 3 Windows 10 or Mac laptops. Note *macOS only supports a selection of AMD Graphics Cards. Razer Core X Thunderbolt3 External Graphics Card Enclosure RTX/GTX/AMD GPU Ready Win10 PC/Laptops & MAC/MacBook is rated 4.5 out of 5 by 2. Rated 4 out of 5 by Scruffygav from Works well with a 2018 MacBook Pro I bought this to use with my 2018 15" MacBook Pro, along with an Asus Strix Vega 56 GPU. First impressions of the Razer Core X are that it's heavy. You can tell just by picking up the box it comes in. Second are that it's a big old beast. Make sure you measure things up to check you have room on your desk for it! The weight seems to be mostly in the metal casing. The slide out chassis with all the active components on it (including the PSU) is relatively light in comparison. Why the outer case needs to be built like a small tank, I'm not sure. I can live with it, but I’d rather it was lighter as I’m not getting any younger. Installing the GPU was really easy, there's plenty of room (did I say it was big?). The tool-less access to the chassis is convenient and nicely engineered. Noise wise, it's not bad. While gaming, you won't know it's there. If anything noise is reduced because the laptop isn’t working as hard and its own fans are quieter. Once it's all warmed though and idling, in a quiet room, you will know it's there. Mine has one of those slightly (only slightly) annoying hums that goes away if you press a finger down on the case. When it's on, it charges the MacBook. However I've left the Mac's own charger connected as well and it toggles between the two. I've also connected the HDMI from the Vega 56 and an HDMI cable direct from the Mac (via a TB3 dongle) into my Dell display, via a small HDMI switch box. When the Razer Core X is on, it takes over the display. When I disconnect it from Mac OS, and turn it off the direct output from the Mac takes over (and I still get a charge from the Apple power supply). That’s really nice, because I don't want or need the Vega 56 on all the time. I thought Windows support via Bootcamp was going to require jumping through a great many hoops, but so far it's been pretty seamless. The EGPU is plugged into the right side of the MBP and as long as it's powered up and working in Mac OS before I boot into Windows 10, it is detected and works a treat. I have a feeling it’ll break at some point and break badly and then I’ll have to jump through all those hoops (maybe Apple will formalise support for EGPU’s through Bootcamp before that happens, if I’m lucky). For now though, Forza Horizon 4, 1440p, maxed out settings, all good! :-) Very happy with this piece of kit. I kind of knew it was big and heavy before I bought, but it definitely does what it says on the tin… or should that be armour plating? Rated 5 out of 5 by Bernie71 from A little nervous about noise, but it's pretty quiet I spent quite a bit of time debating which egpu enclosure to buy and even considered the BlackMagic option. It came down to this versus the eGFX Breakaway Box - 650W by Sonnet. Reports said that the Sonnet was quiet and Apple approved. Having loaded min Razer Core X up with a Vega 56, I can report... - It's really quiet. There's some gentle fan swooshing, so not silent, but very inobtrusive. - It's very, very easy to set up. The handle on the back folds through 90 degrees and the whole tray slides out. Super simple. No tools needed. - The build quality is excellent - lovely black aluminium everywhere. - It's big. It's designed to take a full sized card and has a meaty power supply, so double-depth shoebox kinda big. - For a Mac Mini there's zero setup (just beware, you HAVE to boot to a monitor using the built-in mac HDMI if the T2 security chip, THEN switch over to the eGPU outputs - once you are booted you can easily run 2 monitors straight off the eGPU - this is an Apple requirement and not an issue with this box) I honestly can't think of a single reason why you would spend the £200 extra on the Sonnet, plus this looks better!